There is a choice of two seats – select from the condition tab below. Stocks beginning to run low! The TP91 Deck Chair Swing Seat is a beautiful, rustic swing seat suitable for babies and toddlers from 6 months to 3 years 0f age. The seat is constructed from treated timber and all of the edges, front and back, have been rounded for safety. The seat made in a traditional canvas features an anti-tip design. The Deck Chair Swing Seat also has a T-Bar and harness providing additional security and comfort for the child. 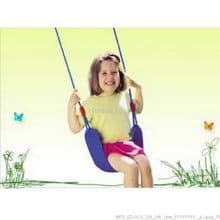 Babies and toddlers learn and experience the fun of swinging in a safe, secure, comfortable seat. The TP Deck Chair Swing Seat is compatible with all TP Swings at both full and low height. 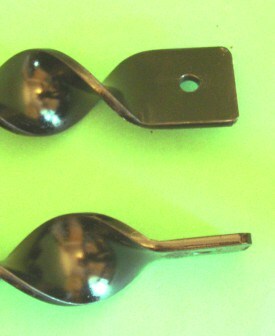 Our seconds are showing some corrosion on the metal parts. It is superficial and does not affect the safety of this swing seat. This has been caused by being kept in a plastic bag inside its box. Every seat has been safety checked. The TP91 Deck Chair Swing Seat from TP Toys is designed around a traditional deck chair. The wooden and canvas design makes a beautiful, rustic swing seat suitable for babies and toddlers from 6 months to 3 years of age. The seat is constructed from treated timber and the edges, front and back have been rounded for safety. The seat is made in a traditional canvas and features an anti-tip design. The Deck Chair Swing Seat also has a T-Bar and harness providing additional security and comfort for your child. 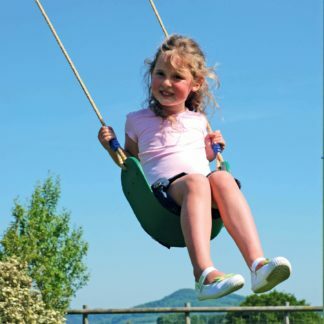 Babies and toddlers learn and experience the fun of swinging in a safe, secure, comfortable seat. The Deck Chair Swing Seat comes fully assembled in the box and can be taken out and used immediately. It is easily attached to an existing swing unit, just clipping straight onto your swing frame and can be hung at different heights. The TP91 Deck Chair Swing Seat is compatible with all TP Swings at both full and low height.